Rajasthani Laal Maas is a traditional Rajasthani Mutton dish which is fiery hot and deep red in color. It is best enjoyed with Indian breads or rice. Here is a video recipe of how to make Laal Mass recipe in traditional Rajasthani style. 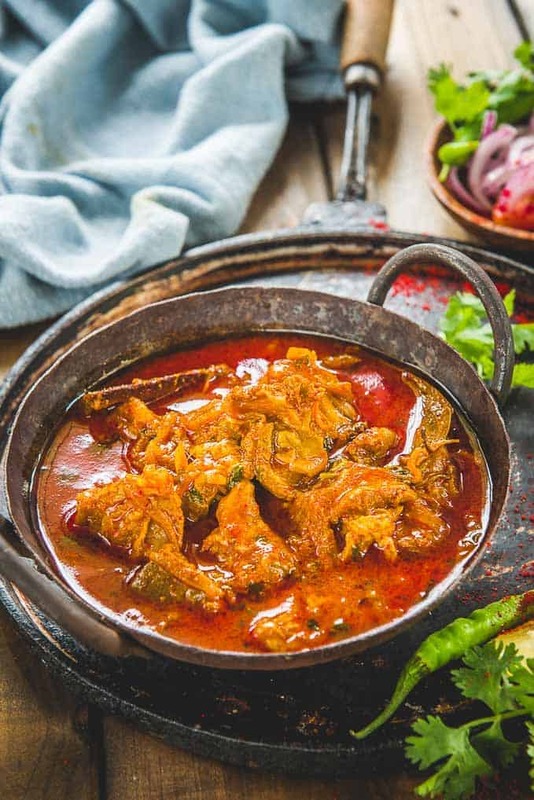 Rajasthani Laal Maas is a traditional mutton dish from Rajasthan. It gets its name from the color this dish has due to the use of red chilies. Traditionally mathania chilies were used to make Rajasthani Lal Maas, which gives it a fiery red color. You can use Kashmiri red chilli powder instead if they are not available where you live. 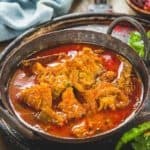 Also traditionally kachari, a type of Rajasthani cucumber was used to marinate the meat but now that it is not available easily, I have not used it in the recipe and made the mutton in pressure cooker instead. This made sure it was well cooked. The dish is very spicy yet very very delicious. Now the catch here is that the Laal Maans that you get in restaurants is not even close to the authentic dish which was is made at home and used to made in Royal kitchens. Since my dad is from Rajasthan and we have many relatives and friends all over the state, I got lucky to taste some of the most delicious traditional recipes in their authentic form and this is the reason I can never appreciate a Laal Mass cooked in commercial kitchens. It’s a labour of love and the amount and proportion of ingredients that goes into making it makes all the difference. 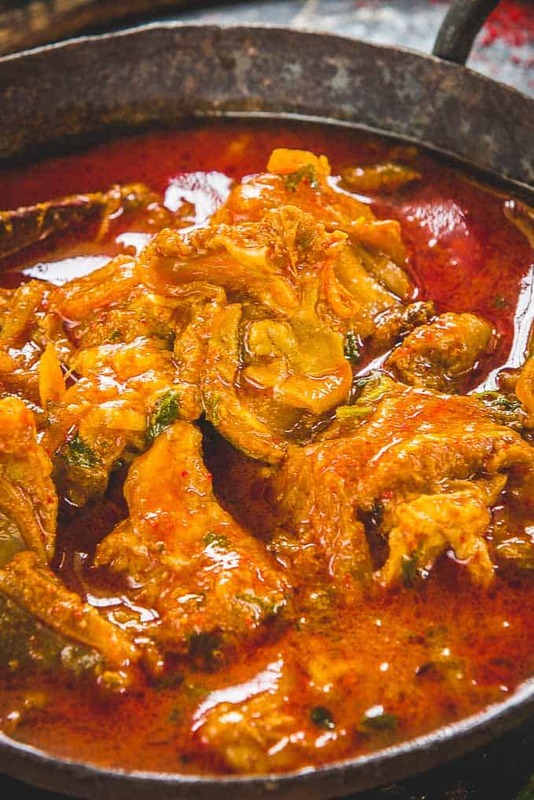 In the earlier days, the mutton used to be cooked with spices on low fire until it was succulent and almost fell off the bones but now to quicken the process, I make my recipe in a pressure cooker and it turns out just as fantastic. I also add whole garlic cloves to the recipe, just how it was done traditionally. You can choose to add 10-15 whole peeled garlic cloves to your recipe too. Use the best quality Mutton from a trusted butchery. The cut of the meat makes a lot of difference in taste and an experienced person only knows how to cut the meat properly. You can also make this recipe on low flame and instead of cooking it in a pressure cooker, cook it covered on low flame for 60-70 minutes. The taste will be different and more authentic. Do not add a lot of water in the pressure cooker before closing it. The mutton will release it’s own water and if you also add too much water, the curry will be very runny. Add the mutton in the pressure cooker before adding yogurt and fry it well on high heat to sear the meat. This will keep the juices locked in the mutton and it will be very flavourful. Using Kashmiri Red Chillies gives this curry a fiery red colour but it’s still not that hot. Ideally Mathania Chillies are used to make this dish. You can also make this curry in ghee. Traditionally either ghee or mustard oil was used to make it. You can replace the mutton in this recipe with chicken and make Laal Maas Chicken instead. Keep the cooking time in check though. To make it smoky, you can give it a dhungar. Heat a piece of charcoal over direct flame until is red hot. keep a bowl in the centre of the pan. Keep the red charcoal in the bowl. Drizzle 1 tsp ghee over the charcoal and immediately close the lid of the pan. Let the curry absorb the smoke for 10-15 minutes. Remove the bowl and give the curry a mix. Where to buy Mathania Chillies from? The fiery red colour of Laal Maas comes from the use of Mathania Chillies. It was a little difficult to source these chillies initially but now they are easily available online and the quality is good too. Click here to order your’s. What to serve with Laal Maas? Laal Maas was traditionally served with Bajre ki Roti but you can definitely serve it with any Indian bread of your choice like Naan, Lachha Paratha or Phulka. It also goes very well with steamed rice. Heat oil in a heavy bottom pan. When the oil is very hot and fuming, switch off the heat. Let it cool for 2 minutes. Switch on the heat again. Add cloves, black pepper, black cardamom, green cardamom, cinnamon and tejpatta. Add the onions and fry till slightly brown. Now add garlic cloves and ginger garlic paste and fry for 3-4 minutes, until onion are nicely browned. Add the mutton and fry for 3-4 minutes on high heat. Add curd and fry for 3-4 minutes. Now add red chilli powder, turmeric powder, coriander powder, roasted cumin powder and salt. Add little water if required and fry till oil starts to separate. Finely add lemon juice. Garnish with fresh coriander. Rajasthani Laal Maas is a traditional Rajasthani dish which is fiery hot and deep red in color. It is best enjoyed with Indian breads or rice. Heat oil in a heavy bottom Karahi / pan. When the oil is very hot and fuming, switch off the heat. Let it cool for 2 minutes. Switch on the heat again. Next up add lemon juice.